You guys, I can't get Darius out of my head. Darius is a teen who's half Persian and half white and he feels like that doesn't actually add up to a whole. Darius loves tea and Star Trek and Tolkien. He feels like he's never good enough and that his dad is always disappointed in him. He's never had a true friend... until he meets Sohrab. Sohrab cares about him and makes his feel valued and seen and connected to... but the problem is that Sohrab lives in Iran and Darius is just visiting with his family. There are so many things I loved about this book. Darius the Great is Not Okay by Adib Khorran is a realistic story of a teen living with mental illness. Darius and his dad both have diagnosed depression and take medication. When Darius visits Iran, a country where mental illness has a seemingly impossible-to-overcome stigma, he's forced to confront his brain chemistry in a different way. Darius's thought patterns are so realistic for someone with depression and anxiety. Throughout the book I wanted to pick him up and give him a hug or sometimes shake him. But his thoughts are his reality. The reader may realize that Darius's dad cares for him, but to Darius the reality that he's experiencing is that he's worthless and no one cares. That he doesn't have a place. This is exacerbated by his feeling like an outsider in many different ways - in America he's different because he's Persian, in Iran he's not Persian enough. This is a story about a boy having feelings who feels like he's not allowed to have feelings. I think this is probably something that is pretty prevalent no matter where you're growing up, and it's great to read about a protagonist who not only has feelings but remains true to himself by expressing those feelings. Darius feels like he's an outsider no one will love because he can't help that he is the way he is. He doesn't realize that people might look up to him for staying true to himself even when it makes him an outsider. Throughout the book there's this chorus of "That's normal. Right?" usually said about stuff that is not really okay with Darius. And the journey in this book is Darius beginning to realize and accept that sometimes he's not okay. And that it's okay not to be okay. I loved experiencing and learning about details of Iranian life through Darius's story, too. Because Darius is visiting Iran for the first time, he's learning a lot too, so his sharing of details and explanations feels very organic. And I personally loved the Star Trek jokes throughout the book - not every reader will get those and that's okay, but it added something extra for those who are familiar with The Next Generation. I'd hand this to fans of John Green looking for more thoughtful teen protagonists. It's out August 28, so pre-order now! 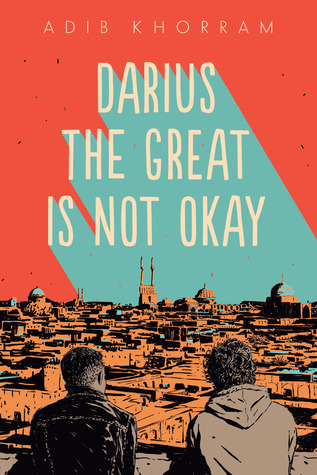 Darius the Great is Not Okay by Adib Khorran. Grades 7 and up. Dial, August 2018. 320 pages. Reviewed from galley provided by publisher. Just found your blog through Good reads, and I'm so glad I did! Added this to my holds list!